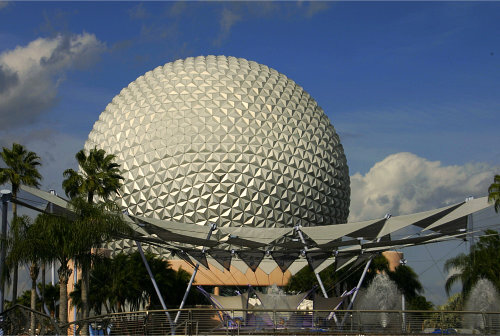 Epcot, which stands for Experimental Prototype Community of Tomorrow, is the land of innovation and international communities. The main entrance to Epcot begins with Future World, which features rides and attractions designed to introduce you to the history and the future of technology. Design and test a car of the future at Test Track, tour mankind’s history on Spaceship Earth, fly around the globe and discover faraway places on Soarin’, learn about plants and the future of agriculture in The Land, blast off on a Mission to Mars, and design and ride your own virtual roller coaster at Innoventions. The World Showcase, situated around the World Showcase Lagoon, features eleven countries authentically represented through architecture, shops, rides, films, entertainment, and food. Mexico and Norway supplement their country’s themes with lighthearted rides, and China, France, and Canada show films of their history and landscape. Germany, the American Adventure, Japan, Morocco, and the United Kingdom offer other types of entertainment such as live bands or performances. Epcot is spread out over more acreage than the other Disney Parks, which makes it seem less crowded, but long lines still form for the more popular rides in Future World. The Phineas and Ferb: World Showcase Adventure is an interactive game where you help Agent P defeat Dr. Doofenshmirtz. To play the game, pick up a F.O.N.E. (Field Operative Notification Equipment) at a Training Facility. Completing your mission causes fun and surprising things to happen throughout the World Showcase. Epcot also hosts two seasonal events: the Flower and Garden Show as well as the Food and Wine Festival.